CurcuminPro®, which uses a tasteless curcumin-protein conjugate with unmatched bioavailability called CPro®, is coming soon to RevNutrition.com, adding to the ecommerce website’s already extensive line of nutritional supplements. CurcuminPro® products include capsules, chewables, powdered drink mixes, bottled drinks, chocolate and jelly bean confections, and even pet food toppers. CurcuminPro® products are safe for all ages and even many species. People have written to us about giving CurcuminPro® Ultapet Pet Care to their dogs, cats and even other exotic pets to treat health issues. CurcuminPro® products contain the active ingredient CPro®, which is 36 times more Biosoluble™ than standard curcumin, is better absorbed by the body and better assimilated into it. 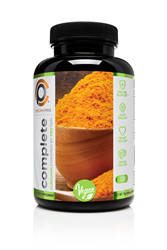 CPro®, has no taste or odor, unlike any other curcumin supplement on the market, making it a unique addition to any health and wellness retailer. “There are tons of protein powders and nutritional shakes out there, but CurcuminPro® is the first with the CPro® curcumin-protein conjugate,” CurcuminPro® CEO Ron Gourley said. “Curcumin is known to have positive health benefits including boosts to the immune system, help with allergies, runny nose and sneezing. Curcumin is anti-inflammatory, has potentially anti-cancer properties, helps with asthma and has more health benefits than I can list here. How many other proteins can do that? CurcuminPro® products include capsules, chewables, powdered drink mixes, bottled drinks, chocolate and jelly bean confections, and even pet food toppers. CurcuminPro® recently launched a campaign, “This body movies with CurcuminPro®,” showcasing the benefits of using CurcuminPro® to supplement daily nutrition. Humans have used curcumin medicinally for more than 3,000 years, mainly through turmeric-based spices, rendering it one of the most studied nutraceuticals in the world. Curcumin is an anti-inflammatory compound similar to fish oil, believed to provide powerful cancer-fighting properties, cognitive benefits, and improvements to skin, the digestive system, skeletal and joint health, liver function and more. CurcuminPro® products have 1,200 milligrams or more of the patent-pending CPro® per serving. CurcuminPro® comes with either whey protein isolates, or vegan-friendly brown rice protein isolates. It also offers pre-formulated bottles designed with nutrient profiles that include probiotics, vitamins, minerals, fiber and the detoxifying TerraPro™.